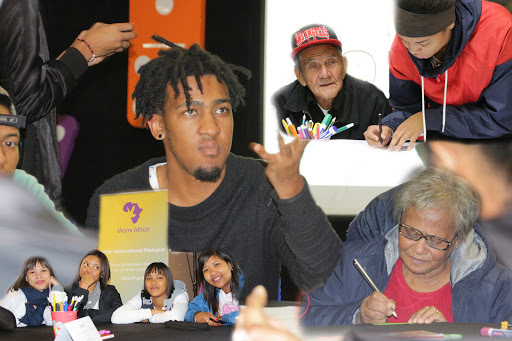 On Monday the 23rd of April 2018 MOMI AFRICA in collaboration with RLabs Women and Mastercard hosted our first Intergenerational Dialogue where we brought both youth and seniors together in one space whereby they had to look at Innovative ways and services they can use to help both parties. We had 56 Seniors and 25 Youth join us for this event where they were challenged to solve complex problems our senior and young people face on daily basis. The seniors and youth were split into groups and given statements/problems they needed to discuss and come up with solutions to address the things these complex issues the seniors and youth have to deal with on daily basis. One of the questions posed to some of the senior people was ‘What they would like youth to assist them with’, and one of the interesting they mentioned was for the young people to just make some time for them or go to the shops and run their day to day errands. We had the groups work on 3 Activities. The first one was where they needed to create a persona of a young person and a persona of an elderly person they had to give this person a name as well as where they came. The second activity was where the seniors needed to share with the youth what kind of support it is they need from the young people, and the young people needed to tell the seniors what it is they needed from the seniors. The last activity they did was where they needed to choose one service the seniors would like the youth to render to them and then come up with actions steps to put this in place. The purpose and the focus of this Co-Creation/ Event/Intergenerational Dialogue were to get youth and seniors to engage with one another and see how they can participate and develop programs or business-related skills such as business planning and customer services. And as well as providing services to seniors and their communities.